The Portland Winterhawks may be the only team in the Western Hockey League -- maybe in all of junior hockey -- to have three players selected in the first round of the 2010 Entry Draft, June 25-26 in Los Angeles. There's a good possibility four of their players -- center Ryan Johansen, right wing Nino Niederreiter, left wing Brad Ross and defenseman Troy Rutkowski -- may be taken in the top 50, and five, including defenseman Taylor Aronson, in the top 100. In the two years since Calgary businessman Bill Gallacher purchased the Winterhawks, they have gone through an amazing transformation. Under coach Mike Johnston, who served as an assistant coach in the NHL for eight years, the Winterhawks won 25 more games and had 48 more points than last season. They had their best regular season since 1997-98 and won their first playoff series since 2006. A big reason for that success was the great play of the line of Johansen, Niederreiter and Ross. They also comprised the team's top power-play unit, which was quarterbacked by Rutkowski. Johansen is a tall, rangy 6-foot-2 and 180 pounds. He had 69 points in 71 games, tying for second among WHL rookies. Johansen is the No. 10 North American skater in Central Scouting's final rankings, up six places from January's midseason report. "He has good on-ice vision and also angles well on the forecheck," said B.J. MacDonald, who covers the WHL for Central Scouting. "He has the intelligence to play power play as well as penalty kill. He can be shifty and has the ability to beat a defenseman one-on-one. Once he fills out and gains more strength, he could turn raw talent into a valuable center at both ends of rink. He has displayed nice playmaking capabilities and this should continue at the next level." Niederreiter, 6-1 and 201 pounds, had a team-leading 36 goals, second among WHL rookies, and 60 points. He was the first Winterhawk since 2005 to score more than 30 goals and he was named to the league's Second All-Star team. 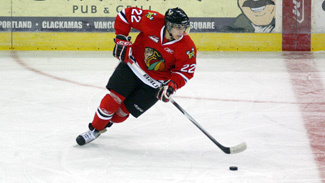 Niederreiter led the Winterhawks with 8 goals in the playoffs. He's No. 12 among North American skaters on Central Scouting's list, up two places from midseason. He also led Switzerland to the semifinal of the 2010 World Junior Championship and was named to the tournament All-Star Team. His glove-tossing, one-handed goal in the breakaway contest during the skills competition at the CHL/NHL Top Prospect Game in January remains must-see viewing. 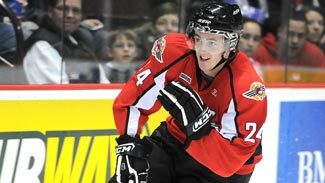 "He's been tremendous in Portland," a scout for an Eastern Conference team told NHL.com at the World Juniors. "He's one of the first Swiss kids that you've been able to see here come in and combine his skill with the physical part of the game which usually you don't get from the Swiss. … Lot of these games they (Switzerland) don't have the puck that much, the other team does, so he's had to do other things and he's shown that he's willing to pay the price." Ross, 6-foot and 175 pounds, is ranked 59th, up 10 places from midseason, after totaling 27 goals, 68 points and a league-leading 203 penalty minutes. "He's responsible at both ends of the rink, very good hustle, and he blends feistiness with good hockey skills," said MacDonald. "He has the discipline and smarts of not putting his team in penalty problems. He plays bigger than his size and shows good discipline at this early age, so he should be able to continue and have success at the next level. I like his tenacity and positional play I think he is a better all-round hockey player than people give him credit for." Ross and Johansen will join Winterhawks captain Brett Ponich, a defenseman taken in the second round of the 2009 draft by the St. Louis Blues, at Hockey Canada's summer junior evaluation camp, to be held in August in Saint John, Nfld. Rutkowski, 6-2 and 208 pounds, is No. 44 on Central Scouting's list after totaling 12 goals and 43 points. "He has worked hard through the course of the season on fitness and his all-round defensive game," said MacDonald. "He has good offensive instincts, which is hard to teach. He knows when to jump up in the play to make an odd-man situation, which is a huge plus. He can be taught better defense as he matures. He has good size so he will learn to be stronger in his own zone, and his containment is improving. I think he is a smart enough player to realize he can balance both facets of game to be successful at the next level." Aronson, 6-foot and 196 pounds, moved up two places to No. 88 after a season that saw him finish with 5 goals and 25 assists. It's not surprising those players moved up during the second half of the season. Johnston said he began to realize his players' potential about 20 games into the season and then made a series of trades to get stronger in goal and to give his 18-year-olds more ice time. "We were put together in a line early this year. Even in exhibitions, they put us together and we kind of just clicked and had some chemistry right from the start," Johansen said. "We kept having success throughout the year and we all had a great year and had a lot of fun doing it. They're two fun players to play with all the time. Nino puts the puck in the net if he has a good scoring chance, so my job was to get him the puck. Ross has great skills but he's more of a speedster, an agitator, and a crash-and-banger. So it was a very fun year." Niederreiter could become the highest-drafted Swiss player ever, ahead of Michel Riesen, who the Edmonton Oilers took at No. 14 in 1997. Riesen played only 12 games for Edmonton in 2000-01. "We worked perfect together," Niederreiter said. "Ryan Johansen was our playmaker. He did a great job this season. Brad Ross was our grinder and hard worker in the offensive zone. I just tried to be the scorer on this line and I think we worked perfect together." Ross is all business. When he told that it's rare to see a player get more penalty minutes (203) than his weight (175), he just nodded. "The physical play is one of the key elements of my game," he said. "I like to agitate out there. I'm not really scared of anybody. I try to protect Nino and Johansen out there, but they can hold their own, too. "I usually try to get in there first and bang bodies with my physical play to give Ryan a little more space. It's pretty easy because if you give him the puck, it's going to be in the back of the net nine out of 10 times." Rutkowski tries to model his game after Mike Green and Drew Doughty. He enjoys being a quarterback on the power play, and enjoyed playing with Ross, Johansen and Niederreiter. "That line's good. We had a great success with Ryan and we had a full power-play line," Rutkowski said. "We had a solid power-play line there with all draft-eligibles. We've had a whole line that works as one unit. Ross creates space, Ryan gets the puck to Nino. Nino can finish. Actually, all three of them can finish. So, yeah, it's been really good to play with them." Aronson, a native of Placentia, Calif., who grew up seven miles from the Honda Center in Anaheim and played for the Los Angeles Junior Kings, was a first-round draft pick in the USHL last year but instead chose Portland, citing the opportunity to play for Johnston.